Forty kilometers southeast of Kutna Hora, along the main highway, lies Havlickuv Brod. The Havlickuv Brod region is the home of a large number of Vyborny descendents, although the surname itself is no longer as common there as it once was. Prior to the establishment of the Czech state and until the end of the Second World War, Havlickuv Brod was called Nemecky Brod. MUDr. Josef(*1864) Vyborny studied for a time in Nemecky Brod and returned there to examine the matrika books of the nearby parishes in his search for Vyborny family members. He found many . The Havlickuv Brod region is the home of the ancestors of the two readily identifiable Vyborny families in Chicago. Josef(*1859) Vyborny came to the United States around the turn of this century as part of the second great emigration from the Czech lands, the first being in the middle of the nineteenth century when Jan(*1811) and Josef(*1828) arrived. Josef(*1859), a widower, landed in Baltimore with his four sons and his housekeeper settling then in Chicago. 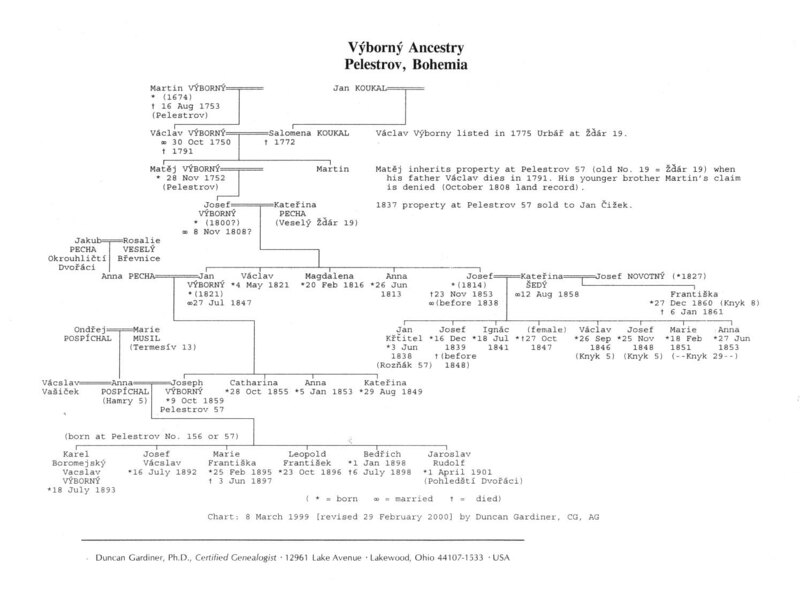 Josef was likely the great great great grandson of Martin Vyborny (see the chart), uncle of Jan(+1776) Vyborny the chief of the farm at Pelestrov, a small hamlet to the north of Havlickuv Brod (between Knyk and Vesely Zdar). 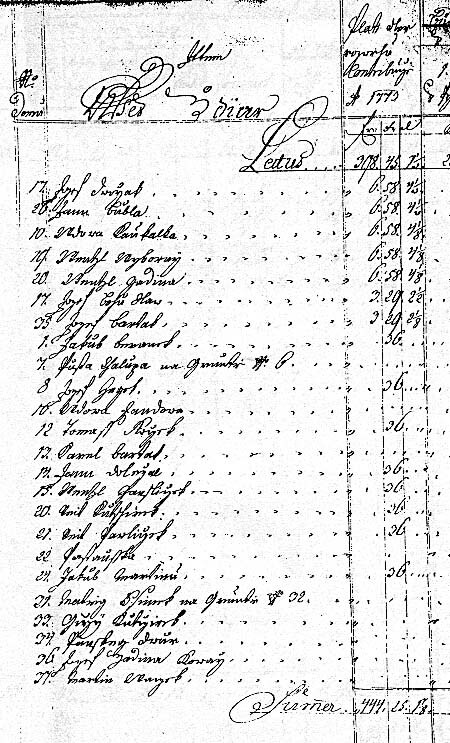 A listing of Josef's greatgreatgrandfather Vaclav (Wenzl) can be seen in the Urbar for Pelestrov in 1775, the year before the American Revolution. Two of the sponsors of this web site are descended from the Pelestrov line of the Vyborny family. 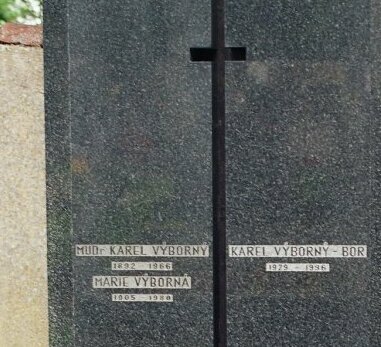 Photo of the grave of Vyborny's of Lipa. 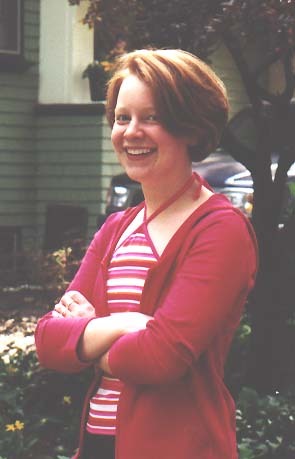 The second Vyborny family in the Chicago area comes from Lipa, a village to the southwest of Havlickuv Brod. There is to this day an identifiable Vyborny family in Lipa. In the past this included MUDr. Karel Vyborny, a prominent local physician. Dr. Vyborny's plan to develop a resort and spa in the area related to natural springs was ended by the Second World War. Unlike some Vyborny family members living in and nearby Kutna Hora the Vyborny ancestors of the Havlickuv Brod region were often Catholic in faith. The Pelestrov and Lipa Vyborny's aided each other in the transition to the New World, regarding themselves as family. Those born around 1900 called each other second cousins, although records now indicate that they were at least third cousins. The descendents of the Pelestrov and Lipa Vyborny's for the most part still live in the Chicago area, home to one of the largest Czech populations in the world. Czech patriot Karl Havlicek overlooking the skyline of Chicago. A Vyborny family originating in Havlickuv Brod now also lives in Brazil.